In addition he said that the area of au- inaugurated one of India’s largest Mari- gency power supply, a complete mimic simulator is equipped with a motion tomated assessments will grow exponen- time Training Centers in Chennai, India, pipeline system of machinery spaces, platform based on six degrees of free- tially, as more sophisticated algorithms a training center equipped with a com- and an independent station for local or dom and is capable of operating multi for instructors to create assessment pa- plete range of maritime simulators from emergency control of main engines and crane models including quay crane, rub- rameters and have the systems support ARI including full mission navigation, auxiliaries. ber tyred gantry & rail mounted gantry. their work in assessing risks and risk engine room operations and cargo han- • The Full Mission Liquid Cargo This full mission crane simulator is zones during live missions is a growing dling simulators among others. Handling Simulator comprises digital installed with ? ve visual channels, ful- area. The Full Mission Ship Maneuvering operating and monitoring controls dis- ly enclosed replica cabin and a motion “We are already supporting a large Simulator is characterized by a ‘near- played on screens embedded in a full platform. It simulates a real crane cabin amount of automated assessment guid- real’ level of visualization over a 240 de- size Cargo Control Console (CCR). with controls accessible on either side of ance provision to instructors,” Rewari grees ? eld of view. The visual scenario is the operator’s chair, an out of cabin view said. “For example, our systems have made up of a large array of 29 channels NUSI Offshore Training Institute and a microphone for communication. 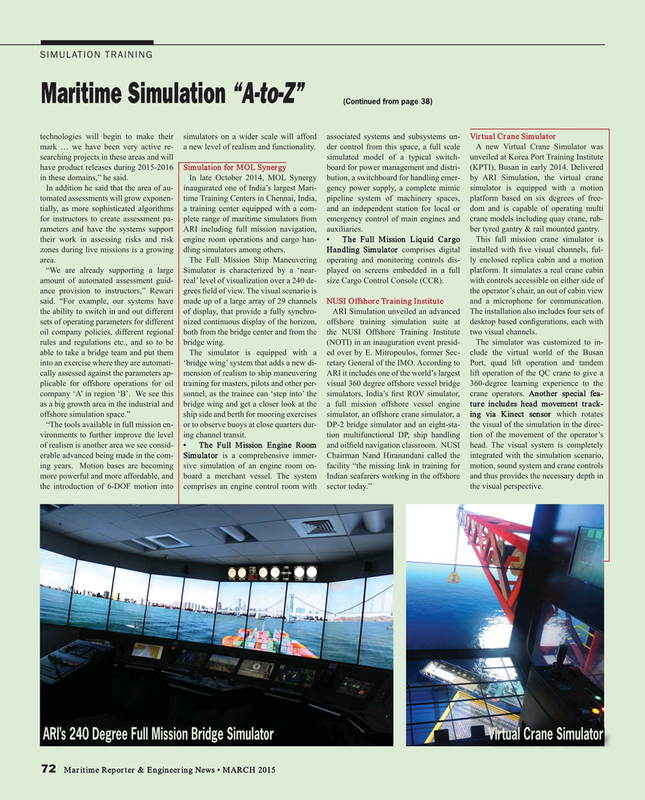 the ability to switch in and out different of display, that provide a fully synchro- ARI Simulation unveiled an advanced The installation also includes four sets of sets of operating parameters for different nized continuous display of the horizon, offshore training simulation suite at desktop based con? gurations, each with oil company policies, different regional both from the bridge center and from the the NUSI Offshore Training Institute two visual channels. rules and regulations etc., and so to be bridge wing. (NOTI) in an inauguration event presid- The simulator was customized to in- able to take a bridge team and put them The simulator is equipped with a ed over by E. Mitropoulos, former Sec- clude the virtual world of the Busan into an exercise where they are automati- ‘bridge wing’ system that adds a new di- retary General of the IMO. According to Port, quad lift operation and tandem cally assessed against the parameters ap- mension of realism to ship maneuvering ARI it includes one of the world’s largest lift operation of the QC crane to give a plicable for offshore operations for oil training for masters, pilots and other per- visual 360 degree offshore vessel bridge 360-degree learning experience to the company ‘A’ in region ‘B’. We see this sonnel, as the trainee can ‘step into’ the simulators, India’s ? rst ROV simulator, crane operators. Another special fea- as a big growth area in the industrial and bridge wing and get a closer look at the a full mission offshore vessel engine ture includes head movement track- offshore simulation space.” ship side and berth for mooring exercises simulator, an offshore crane simulator, a ing via Kinect sensor which rotates “The tools available in full mission en- or to observe buoys at close quarters dur- DP-2 bridge simulator and an eight-sta- the visual of the simulation in the direc- vironments to further improve the level ing channel transit. tion multifunctional DP, ship handling tion of the movement of the operator’s of realism is another area we see consid- • The Full Mission Engine Room and oil? eld navigation classroom. NUSI head. The visual system is completely erable advanced being made in the com- Simulator is a comprehensive immer- Chairman Nand Hiranandani called the integrated with the simulation scenario, ing years. Motion bases are becoming sive simulation of an engine room on- facility “the missing link in training for motion, sound system and crane controls more powerful and more affordable, and board a merchant vessel. The system Indian seafarers working in the offshore and thus provides the necessary depth in the introduction of 6-DOF motion into comprises an engine control room with sector today.” the visual perspective.